University Park – Teach. Empower. Transform. 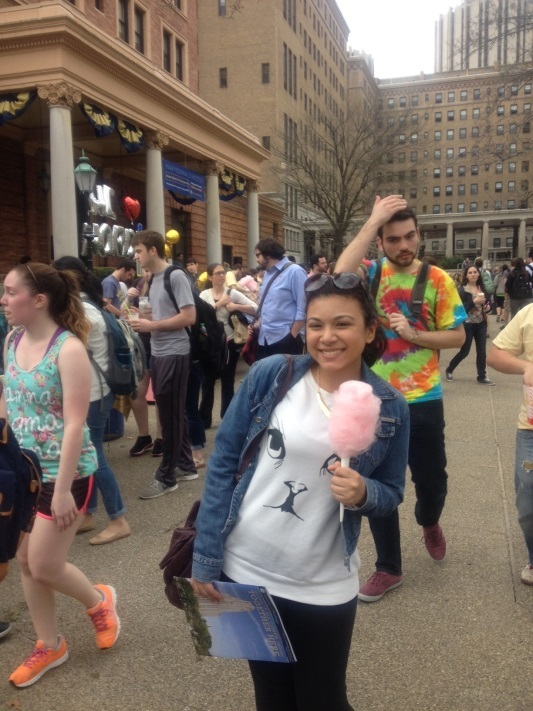 Rosa, an 11th grade Scholar, enjoys some complimentary cotton candy at UPitt. Fifteen FLOC 11th grade Scholars took advantage of their week off from school to join myself and two other FLOC staff members on a five-day college tour. During the week, we visited six schools and traveled through five states. Our first stop was Pittsburgh where we visited the University of Pittsburgh (UPitt) and the Community College of Allegheny County. For some students, this was their first opportunity to spend substantial time on a college campus. We had a great time in Pittsburgh and were able to enjoy some of the campus festivities happening on UPitt’s campus during our visit. Pennsylvania State University at Altoona was our next stop. Despite the drizzle, we had definitive backwards-walking tour guides who shared their love for Penn State Altoona with our students. Students asked a lot of questions and loved seeing the contrast between a very large school, UPitt, and a smaller school, Penn State Altoona. We broke up our drive by stopping by the main Pennsylvania State University campus in University Park to enjoy ice cream from the on-campus creamery before traveling to Syracuse, New York. One tour group of students with their St. Joseph’s University guide. After a run in with a sudden April blizzard, we awoke to fresh snow in Syracuse which luckily melted as the sun joined us out on our tour of Syracuse University. 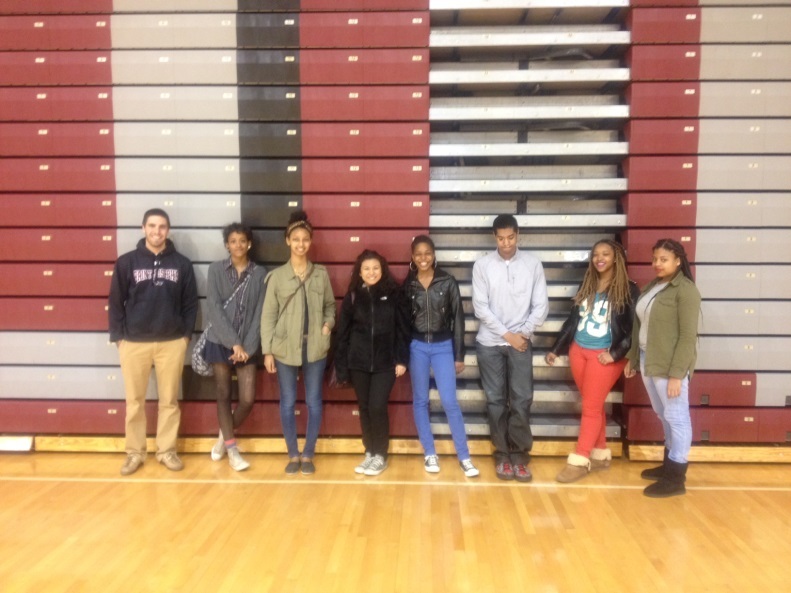 Students enjoyed seeing the indoor stadium and hearing about the on-campus flight simulator. Once we were done comparing the food at Syracuse with our previous cafeteria visits, we headed to Philadelphia just in time to attend a Phillies baseball game. We spent the evening cheering on the home team and ended our trip by visiting the beautiful St. Joseph’s University (SJU), where we heard all about Hawk Basketball and voted SJU as having the “best cafeteria food” of our trip by a landslide. 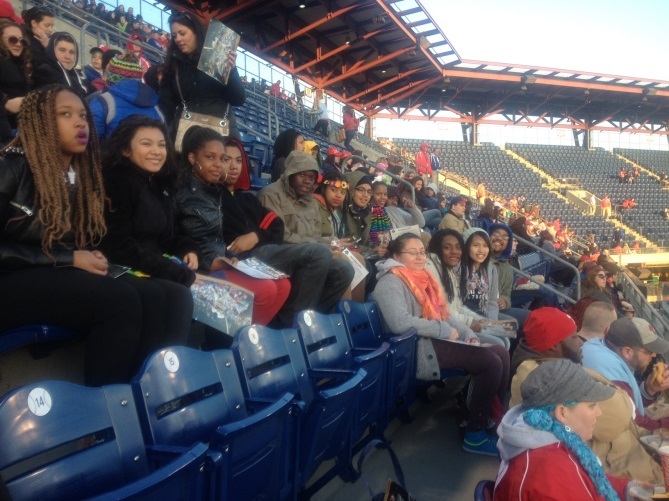 Students enjoy a chilly Phillies Game. At all of the colleges we visited students asked a lot of questions, ate in the on-campus dining halls and gained knowledge about different types of post-secondary institutions. I was impressed with the information our students retained about each campus visit and appreciated hearing the progression in the complexity of their questions as the week passed and we visited more schools. This week also gave me the opportunity to witness friendships blossom between our students and get to know them outside of the FLOC building. When the time comes for these 11th graders to begin applying to colleges next fall, FLOC’s high school class of 2015 will know what to look for when deciding what colleges might be right for them. I am excited for the roller-coaster year that awaits them! Test your knowledge of some of the schools we visited with trivia we learned on our tours! 1. Which college that we visited is Bob Costas an alumnus of? What international event does he take undergraduates from this university to every two years? 2. What two Pennsylvania counties does St. Joseph’s University span across? 3. What is the capacity at Pennsylvania State University’s main campus stadium, Beaver Stadium? 4. On which campus that we visited are ducks federally protected? 5. At what college was a famous children’s TV show (involving sweaters!) filmed at? What is the name of the TV show? Answers: 1. Syracuse; the Olympics 2. Philadelphia and Montgomery 3. 107,282 4. Penn State University – Altoona 5. UPitt; Mr. Roger’s Neighborhood. (Lauren Ballinger is a Scholars Program Instructor at FLOC).